Last week was more significant for Downtown San Diego than the average visitor or resident may have realized. Of course, no one could miss the thousands of people who flooded the streets of East Village and Gaslamp for Padres 2019 Opening Day – daring to dream that the day’s win would be a hopeful harbinger of a successful season. While most attendees drank in the ambiance (literally and figuratively) of Petco Park and the East Village Block Party, some remembered the years of conversation, planning and construction that went into creating the quintessentially relaxed, yet modern, ambiance of Downtown. As a non-native San Diegan, it’s not uncommon to hear “old-timers” speak in admiration of how much Downtown San Diego has changed for the better over the years. And a big driver of much of this change came from the development organization Civic San Diego. And yet, another big piece of news came just a week ago. Following the long-awaited settlement of a lawsuit, Civic San Diego will be folded into the City of San Diego as of July 1, 2019. According to a status log published on Civic San Diego’s website, Downtown closed out 2018 with the addition of 624 hotel rooms, 135,000 square-feet of retail space, 44,000 square-feet of office space, 1,833 new apartments, and 232 new condos – the first new condos to be built since 2009. This is also 800 more completed apartments than in 2017. And with eyes ever toward the future, we can anticipate more developments entering the pipeline in the years ahead. A couple of these are key public projects that will substantially contribute to the beloved Downtown vibe. This long-awaited East Village project would provide much needed greenspace to the edgy and urban jungle of East Village. And it has had plenty of time to accrue the support of residents and business in the community over the last couple of years. 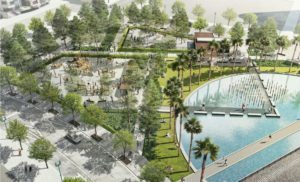 With an estimated 2021 completion date, East Village Green will include a multi-use lawn, children’s area, off-leash dog area, interactive water feature, café, performance pavilion and underground parking. 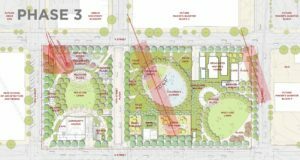 Located between F and G, and 13th and 15th streets, this greenspace is a multi-phase project that comes online in conjunction with an enhanced greenway along 14th Street. 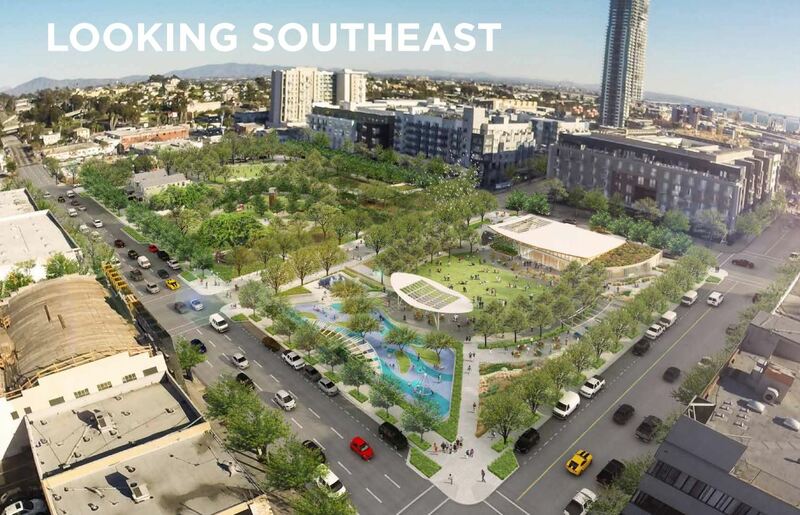 The project’s location could also serve as pivotal connection point between the growing and evolving parts of East Village – the largest Downtown subneighborhood. Another project to keep an anticipatory eye on is Children’s Park in Marina. Plans for updates at this park include a walkway over the pond, a children’s playground and shade structures, lots of additional greenery (they’ll keep the current pine trees), an off-leash dog park, and retail and commercial space. Close to the Convention Center and located on the edge of the largely residential Marina neighborhood, these changes have the potential to bring new energy and life to San Diego’s bayside. For residents and businesses interested in tracking these projects, you can keep up on the status and details of projects at civicsd.com/interactive-map/.